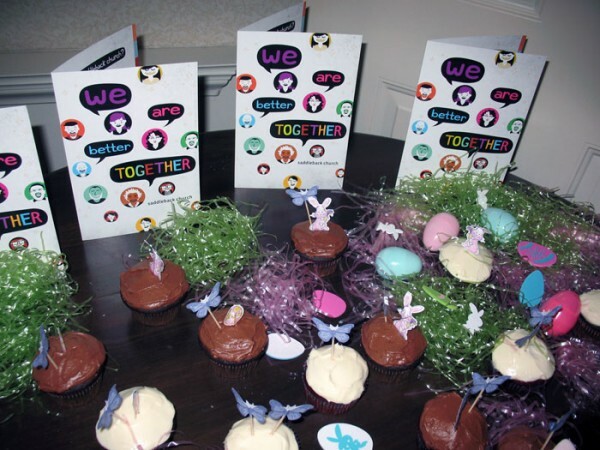 I hope everyone had a fun Easter Sunday with family and loved ones! It’s been a while since my last blog post and here’s what I’ve been up to lately. I had a half day at work on Good Friday. 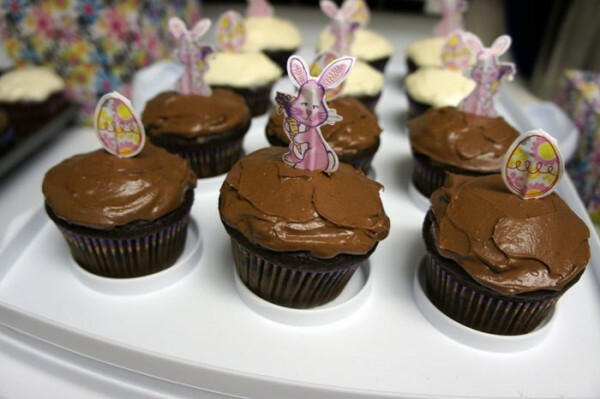 Right when I got home from work, I went straight to a grocery store to buy ingredients for Easter cupcakes. 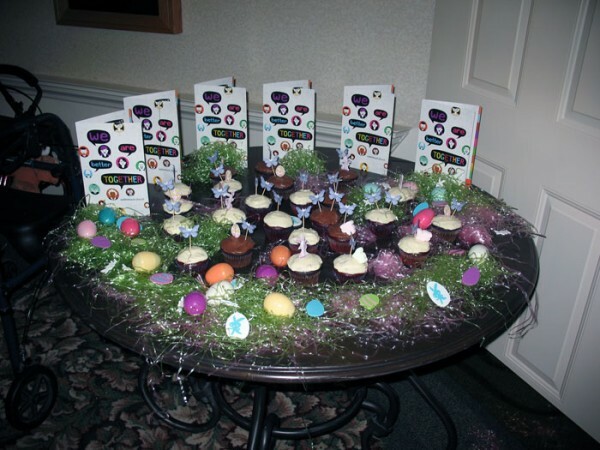 That night, I spent 5+ hours baking 48 cupcakes. 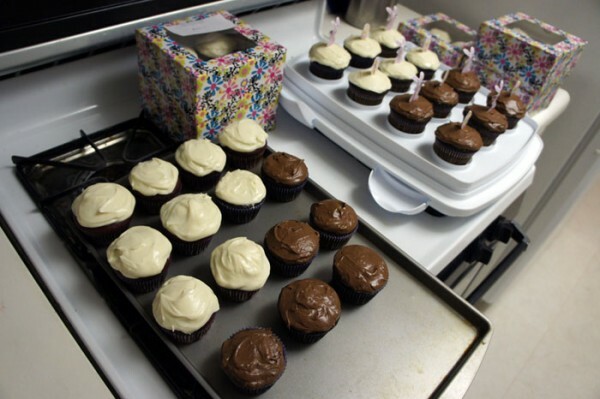 24 Velvet Cupcakes with Cream Cheese Frosting + 24 Vegan Dark Chocolate Cupcakes with Chocolate Buttercream Frosting. The next day which was Saturday, I took 28 cupcakes with me to Park Terrace Senior Living in Rancho Santa Margarita where my best friend, Veronica, plays flute every Saturday during church service (Park Terrace has a small chapel inside the building). As you can see in the photos, Veronica and I were having a lot of fun (probably too much fun, hehe) setting up the table with cupcakes. 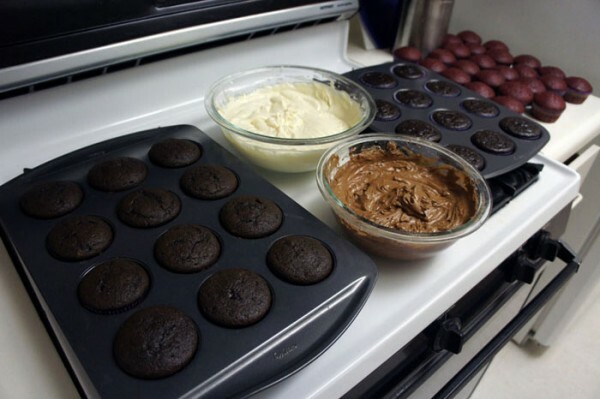 Just in case you’re interested, here’s the recipe for Vegan Dark Chocolate Cupcakes and Chocolate Buttercream Frosting. Oh, by the way, the Chocolate Buttercream Frosting was a little too sweet for me, so I tweaked the recipe by adding more cocoa powder. I also added extra milk since I like my frosting on a more creamy side. I recently created another online portfolio at Coroflot and finally added a couple of projects to my Behance page. I created the Behance account years ago but never added anything to it until now. I’ll continue updating my Coroflot portfolio as I update my portfolio here at Daxis Design. I plan on adding more stuff to my Behance page as I keep working on personal/self-initiated projects as well. 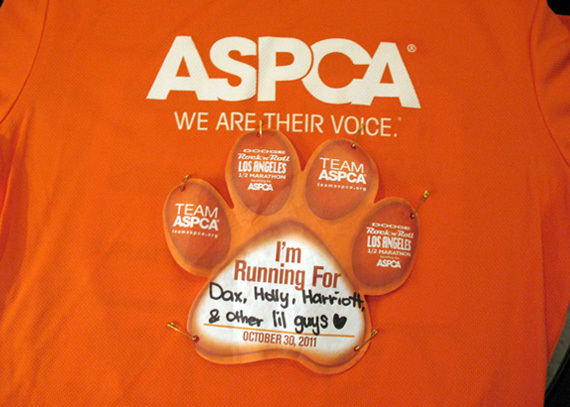 It’s already been almost a month since I ran in the 2011 Rock ‘n’ Roll Los Angeles Half Marathon as a member of Team ASPCA. I’ve been meaning to write a blog post about my first half marathon experience soon after the race and it’s already the end of November. My apologies for the delay! First of all, on behalf of ASPCA and all the animals who cannot personally thank you, I want to thank all of you for supporting me throughout the training and sending a donation to my fundraising page. I had to raise at least $1,000 to run the race and there’s no way I could have done this without you. Thank you so much for every dollar that you donated. I reached my fundraising goal in about 30 hours after I (somewhat) actively started fundraising. By the race day, I had raised $1,965! You have no idea how overwhelmed I was with gratitude, excitement, and joy. I trained hard for 16 weeks. 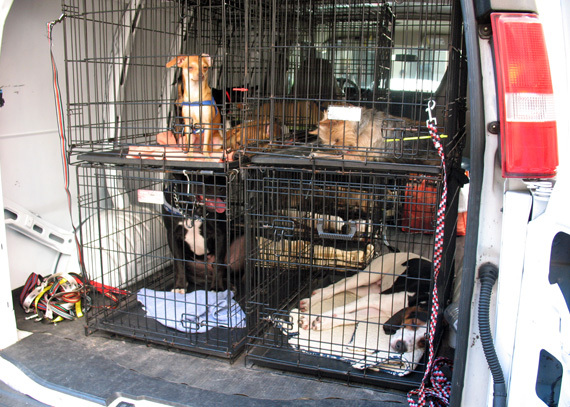 Team ASPCA staff and coaches — we had coaches in San Diego, New York, Los Angeles, and San Francisco — were all very supportive and helpful in every possible way. With virtual training available 24/7, they made it easy even for people with hectic daily schedules to train for the half marathon. I had never run such a long distance before and was pretty nervous about the race. Thankfully, I finished the race with no injuries. It was definitely not easy but not as hard as I expected to finish the race. Watching all those runners who dressed up for Halloween and cheerleaders and strangers who were cheering for runners, I had a lot of fun running. There were also 6 or 8 bands playing throughout the course and Bret Michaels was performing at the event. If you want to see the photos of runners in Halloween costumes and Bret Michaels performing, click here. As part of the ASPCA’s involvement in the half-marathon, we distributed $280,000 in grants to Los Angeles-area animal shelters and rescue groups. Some of the fans who cheered on Team ASPCA from the sidelines (or the nearby Bark Park) were homeless dogs from Bark Avenue Foundation. Rock star Bret Michaels, an animal lover who was performing at the event, met some of the dogs up for adoption and even named one “Little Bret”. Before the race, I thought I wouldn’t want to do another race once I was done with the half marathon. However, I had so much fun on the race day that I’m thinking of doing another race in near future. Now I’m done with rambling. Here are the photos I took. 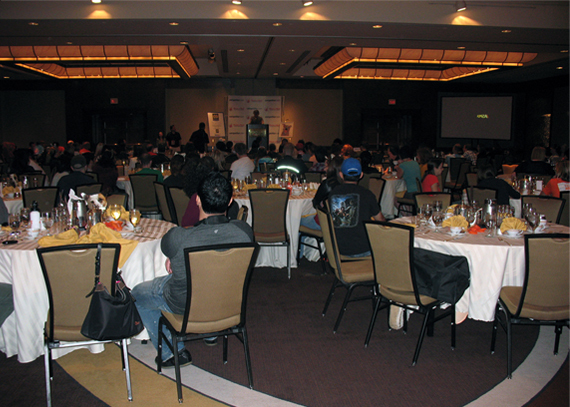 On Saturday morning, October 29, 2011, we had Coaches Breakfast where we got to meet all of the coaches and mingle with other Team ASPCA members. The youngest Team ASPCA member and runner was an 11-year-old girl. Surprisingly, I saw a few young kids who ran the race as Team ASPCA members. The highest amount raised by one person alone was about $7,000. Isn’t that amazing? 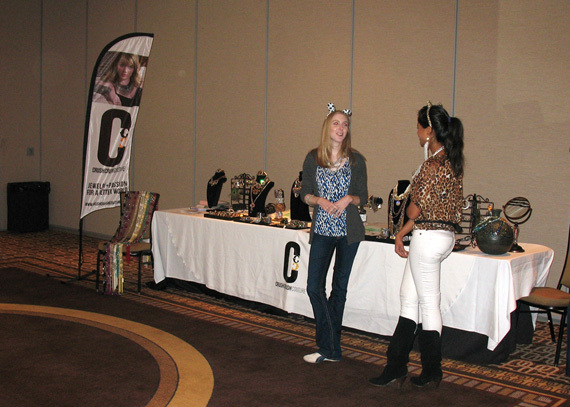 Right next to the room where we had Coaches Breakfast, there were on-site tables where you could buy Team ASPCA exclusive gear and fashionable jewelry by CrushCrush Couture (CrushCrush Couture donates 25% of proceeds to charities such as Team ASPCA). 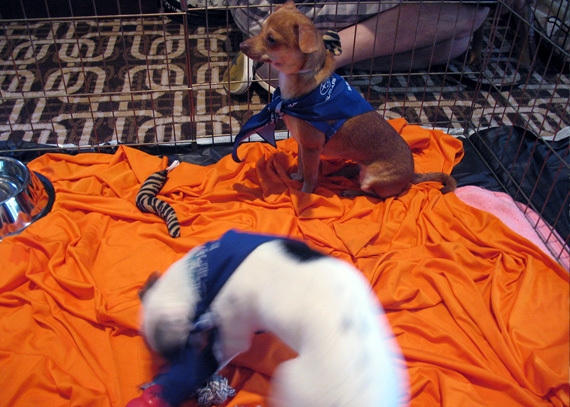 Next to those tables were cute, adoptable dogs from Bark Avenue Foundation. You can see only a few dogs in the photos above but there were many more. Do you see the little guy with shaggy hair? His name is Todo. I fell in love with him the moment I laid my eyes on him and almost brought him home with me. 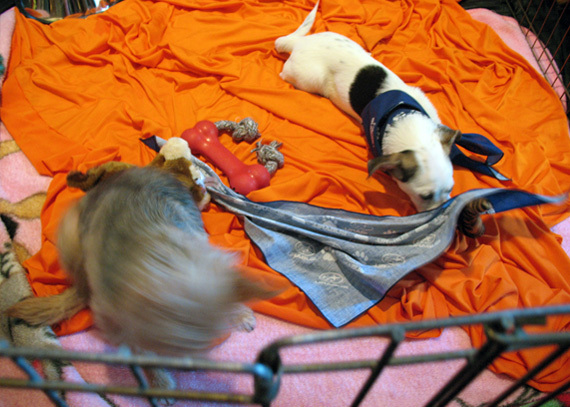 It broke my heart to see so many sweet, adorable dogs who were waiting to find forever homes. I would bring them all home with me if I could but I’m not in a situation where I can have another dog (sigh). 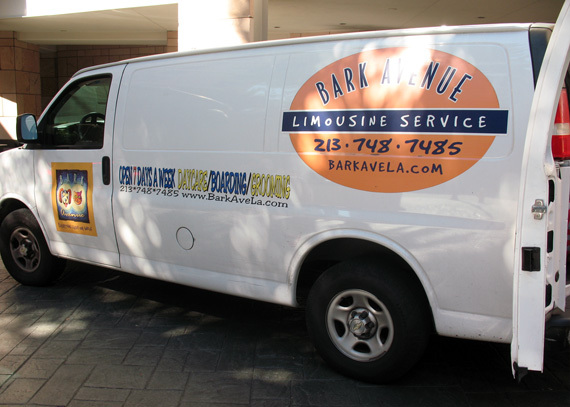 If you live in or near Los Angeles and are interested in adopting a little friend, make sure that you check out the website of Bark Avenue Foundation. After Coaches Breakfast, we all had an opportunity to decorate our Team ASPCA race shirts. 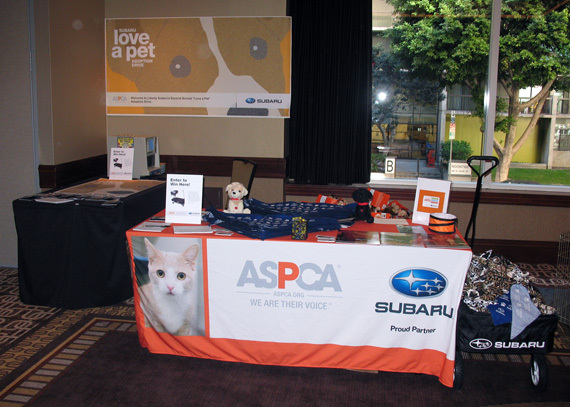 All decoration materials were provided by Team ASPCA. Some people attached photos of their pets and/or foam letters to their shirts. I kept mine simple. 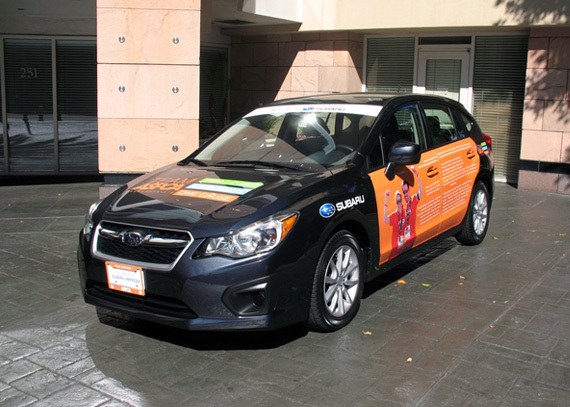 Subaru — one of ASPCA’s sponsors — even had a car with all runners’ names on it. 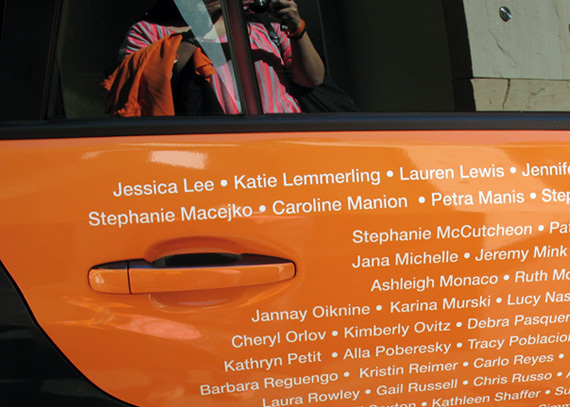 See my name in the close-up photo? 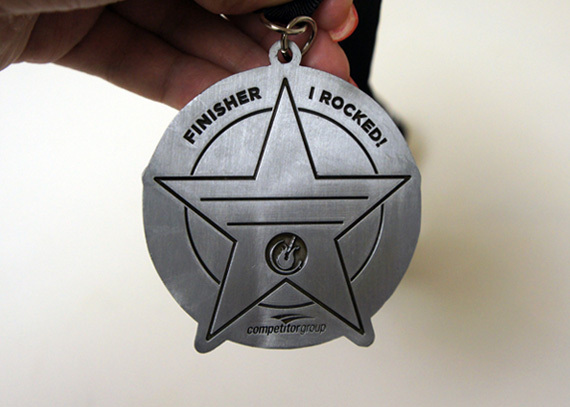 Here’s the medal I got when I finished the race. It’s little hard to see in the photo above but the star is sparkly pink enamel and I love it! Again, I want to thank you for all the support and donations. Also, I want to thank Team ASPCA staff and all of the coaches who were there for us every step of the way, from the very beginning of our training to the end of our race. Both the training and race were great experiences! Say “hello” to my little sweet boy, Dax! 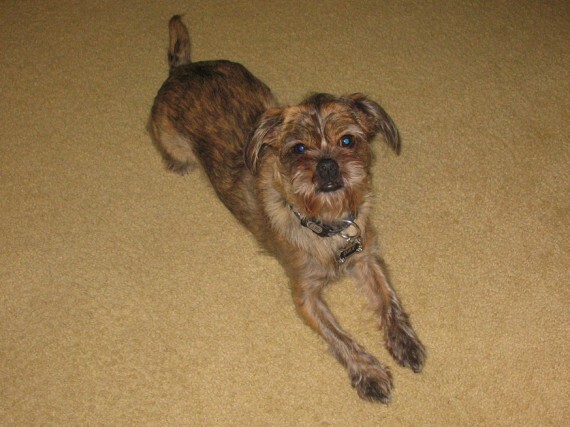 I adopted Dax from a dog rescue group at Petsmart in 2008. He has everything I can possibly ask for in a dog and I love him dearly. If you really know me, you know Dax is more than just a dog to me. He is a very important part of my life and this led me to make a goal I’ve never made before—running a half marathon and fundraising. 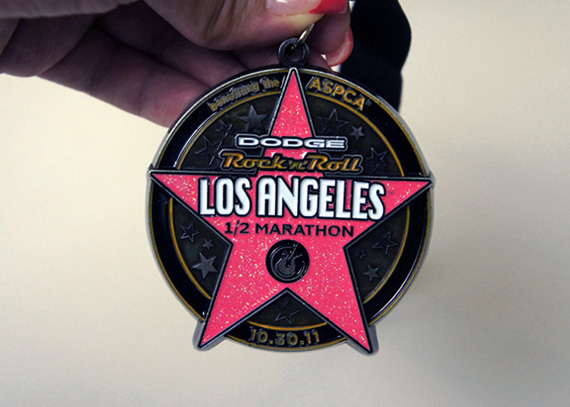 On October 30, 2011 I will be running in the 2011 Rock ‘n’ Roll Los Angeles Half Marathon as a member of Team ASPCA, a national fundraising and marathon training program. 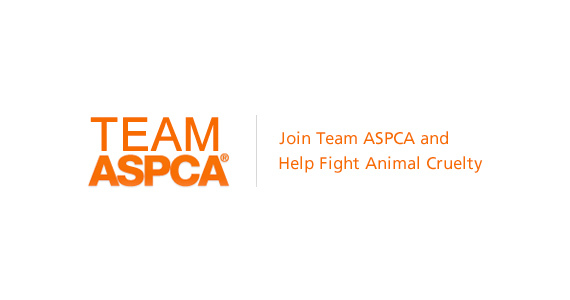 I am excited to be participating in the inaugural season of Team ASPCA and honored to be raising the awareness and the much needed funding to support the ASPCA‘s programs. Your donation will help the ASPCA continue to provide local and national leadership in three key areas: caring for pets and pet parents, providing positive outcomes for at-risk animals and serving victims of animal cruelty. The ASPCA is very important to me and I appreciate your help as we fight to end animal cruelty, homelessness, and neglect. Please visit my fundraising page and support me by making a donation. Please help me make a positive impact in the lives of animals living in my community! I need to raise at least $1,000 to run in the half marathon. Every dollar counts and even the smallest donations will be greatly appreciated. If you are not in a situation where you can support me financially, I understand. I would really appreciate it if you could at least share this blog post or my fundraising page with other people who may be able to help. I’ve been training every week for the half marathon and am looking forward to cross the finish line! As this is my first time fundraising and participating in a half marathon, I need all the support I can possibly get from family, friends, and everyone else. Thank you so much for taking the time to read this post and helping me support an organization that does so much for animals!